You can read more from our farm series here and here. The Denton Community Market is open every Saturday from May - October, so you've only got a few Saturdays left to get down there and support all of the different local vendors. There's a lot of cool stuff a-brewin' at the local community market. We decided to take a closer look at where some of the items come from. In the first installment of our Grow Your Own series, we venture out to Cardo's Farm Projectand visit with Amanda Austin and Dan Moon. Cardo's Farm Project from WeDentonDoIt on Vimeo. 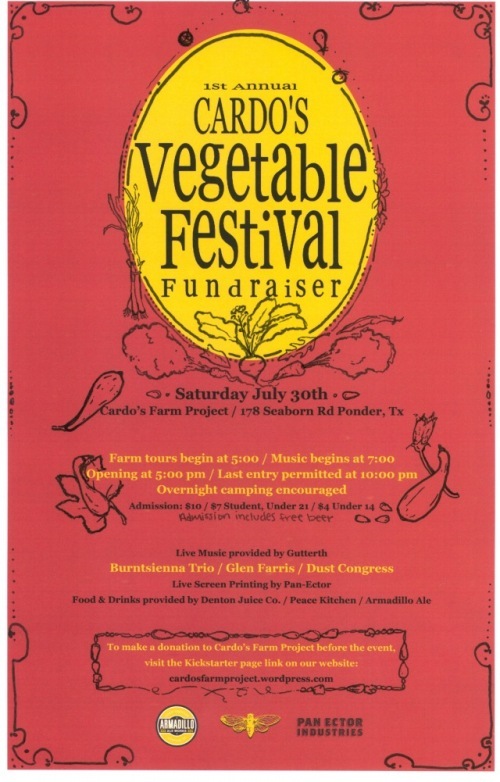 If you're interested in Cardo's Farm Project, make sure and attend their Vegetable Festival fundraiser on Saturday, July 30th. For 10$/$7 (student), you get access to some great music provided by Gutterth, free beer (from the ever-awesome Armadillo Ale Works) and food/drink from the Denton Juice Co. and Peace Kitchen. More info can be found on the flier below.